BasX PT-100 stereo preamp/DAC and tuner features numerous connectivity options and comes with or without Bluetooth functionality. TA100 Integrated Amplifier also available. Emotiva BasX PT-100 is a highly versatile stereo preamplifier, with a high-performance FM tuner, analogue line level inputs for a line-level source or a CD player, a USB DAC and a host of digital input options. Plus, the inclusion of a high-quality phono preamp, supporting moving magnet and moving coil cartridges, means it will be compatible with your turntable. The ability for an additional high-quality AptX Bluetooth module, will enable you to stream from your smartphone, computer or tablet. The tuner has the ability to store 50 preset stations. Operating the PT-100 is easy, by either the intuitive front panel controls, or by using the remote control, that is included. The menu system is very intuitive, plus the information is displayed large and easy to read. The VFD display on the front panel informs you exactly what the unit is doing at all times. The BasX PT-100 produces levels of performance that would normally be expected from much more expensive preamplifiers. Unlike other affordable preamplifiers available, the PT-100 produces super sound output, with an exceptional build quality, that you would expect from a more expensive unit. 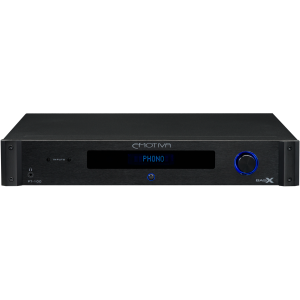 This preamp has amazingly low noise and distortion featuring a wide-bandwidth facilitating true high definition presentations. PT-100 is a result of Emotiva's efforts to create an exceptional audio system to enrich your life with outstanding sound. Emotiva believe that true high fidelity sound is possible without fancy extraneous features like shiny buttons or gold sparkling remote controls. They belive that you do not need all sorts of complicated features you’re never going to use. The design principle to create a great sounding audio system, is to employ top quality components, which can perform technically with exceptional sound quality. Every component in the Emotiva BasX has been specifically designed to be part of an excellent audio system. Incorporating new cutting-edge technology with the features you require for the best possible listening experience. A leading home audio equipment manufacturer, Emotiva have identified that their are a significant amount of people who do not have high-quality audio in their life. Either, the person does not have the budget for good equipment, or they are time-poor, and do not have time to research how to use hi-end hi-fi. Thinking of listeners on a budget or without time, is why the new Emotiva BasX range were developed. The BasX components together perform at a great sound quality level, since they are chosen with care to give fantastic performance, with a elegantly simple design. All of the products in the BasX range have been are priced to be within reach of every music lover. You don’t need to be rich to afford them and you don’t need to be an engineer to figure out how to use them. The products are all carefully crafted to give you the user many years of reliable and dependable service, plus they look great in your living space or on your Hi-Fi rack. 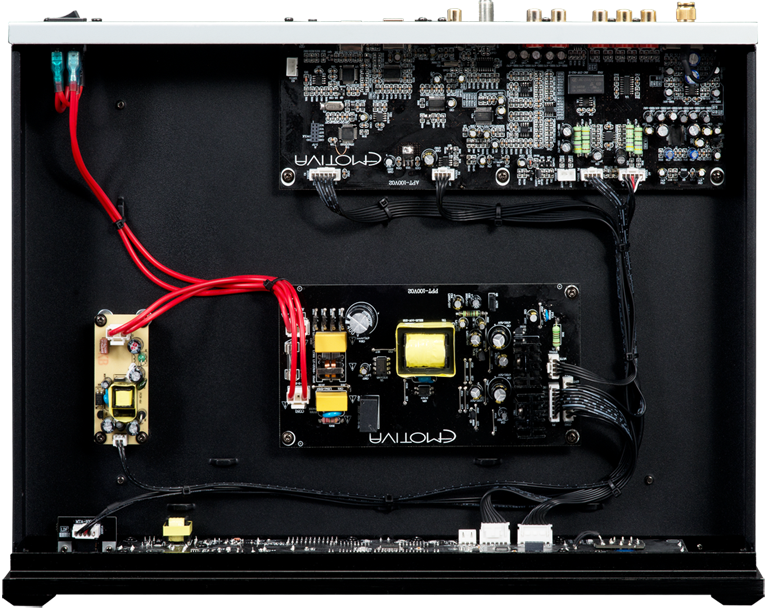 It is possible to build your entire Hi-Fi system from BasX components, giving you a true audiophile experience. Alternatively, you could add one or two BasX components to improve your existing Hi-Fi system. The BasX PT-100 is Designed to operate on either 115 VAC or 230 VAC at 50/60 Hz, the BasX PT-100 automatically detects and configures itself to operate at your specific voltage. 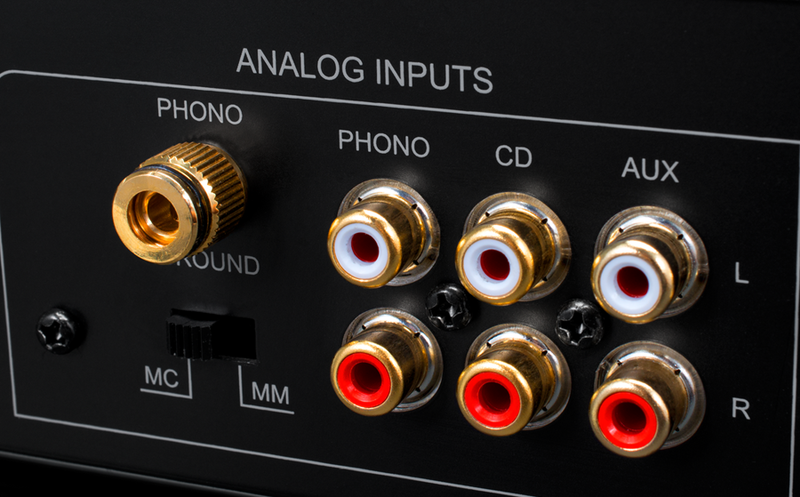 - Range of analogue inputs, dual line-level & high-quality phono, supporting MC and MM cartridges. - Digital inputs, one 24/96kHz USB input, 24/192kHz coaxial, Optical S/PDIF inputs and Bluetooth receiver (optional). - An independent, high current, direct coupled headphone amplifier. - Line level main stereo outputs permits the TA-100 to be used with a separate stereo power amplifier. - In addition, to stereo output, a separate pair of summed outputs to your favourite subwoofer. - Unique balance controls, simultaneously adjusts both channels, so overall sound level in the room is constant. - Full function remote control.